Penetrate the blood-brain barrier // activate at the right time and place // infiltrate less invasively // deliver ultrafocused, targeted treatment. Taking medicine never used to be rocket science. You swallowed a pill and it dissolved in the stomach, entered the small intestine and was absorbed into the blood. From there the drug dispersed throughout the body, delivering at least a little where it was needed. But many drugs are poorly soluble or are eliminated by the liver very quickly, so they have to be taken in high, potentially toxic concentrations to be effective. What’s more, how much of a drug gets absorbed depends on its physical and chemical properties, and some medicines may have trouble reaching their destination. For example, compounds that are fat soluble cross fat-containing cellular membranes easily but won’t dissolve in water. And biologic drugs—immune-system-stimulating marvels engineered from living organisms—tend to be composed of large molecules that can’t pass through the membrane of the small intestine and must be injected rather than swallowed. Getting drugs into the brain is even more daunting because cells lining the blood vessels there are packed so tightly they create a nearly impenetrable defense against particles trying to reach brain tissue. As researchers and pharmaceutical manufacturers have devised ever more ingenious drug formulations, delivery issues have mushroomed. “The problems we face aren’t so much coming up with better drugs but making sure they go to the right place,” says Mauro Ferrari, chairman of the department of nanomedicine and biomedical engineering at the University of Texas Health Science Center in Houston. Ferrari, who trained as a mathematician and engineer, is one of a host of scientists from new disciplines—physics, engineering, robotics—confronting those conundrums. Working with nontraditional materials and technologies, these researchers are finding their way past the body’s intricate defenses to get more of today’s miracle medicines where they need to go. Frequently that’s a life-or-death issue. The cancer drug Taxol (paclitaxel), for example, is poorly soluble unless mixed with a solvent that can cause life-threatening allergic reactions, requiring that patients be pretreated with steroids and antihistamines. Even when the best of anticancer drugs are injected, often only one molecule out of 100,000 hits its mark. That means many drugs have to be given frequently and at high doses, and that tends to cause side effects and toxicity. Ferrari focuses on building nanosize drug carriers that burrow into a tumor before releasing their cargo of drug particles. Other scientists working in the nanorealm are covering drug particles with silicon wires that stick to slippery cells normally bathed in mucus, such as those in the nose and intestines. Another technology being tested is coating nanoparticles with a gel that explodes, sending the particles through the body at nearly 800 times normal speed to force them through thick tissue. Older technologies, too, are being called to new purposes. Ultrasound has shown promise in lab animals for opening a temporary passage to brain tissue never before accessible to drugs. Microprocessors are being embedded in implantable devices that can be programmed to release precise doses of a drug. And a “pill” packed with sensors and a wireless transceiver can release medicine at just the right moment during the pill’s passage through the intestines. All these systems, though still experimental and probably years away from Food and Drug Administration approval, are part of a wave of drug delivery that may change how medicines find the body’s sweet spots. 1. 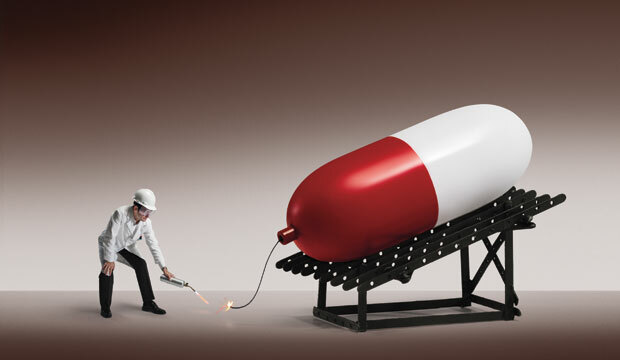 “The Next Generation of Drug-Delivery Microdevices,” by N.M. Elman et al., Clinical Pharmacology & Therapeutics, May 2009. This overview visually illustrates the ingenious technologies being used to treat acute and chronic diseases as well as trauma. 2. “Progress and Problems in the Application of Focused Ultrasound for Blood-Brain Barrier Disruption,” by Natalia Vykhodtseva, Nathan McDannold and Kullervo Hynynen, Ultrasonics, April 14, 2008. Having built upon a 50-year-old finding that an ultrasound beam can disrupt the blood-brain barrier, the authors describe recent research showing that drugs can be targeted at selected areas. 3. “Five Big Ideas for Nanotechnology,” by Jon Evans, Nature Medicine, April 2009. Evans examines five scientists’ concepts for drug-containing nanoparticles, from particles coated with nanowires that stick to cells like burrs to particles that release different drugs when exposed to different wavelengths of light.